On Thursday, April 11, 2019, four marauders from Renaissance Advanced Toastmasters journeyed north from Westboro to Boston. Their mission: procure the Traveling Gavel from the Curious Toasters club. The intrepid raiders had to overcome not only traffic snarls; a labyrinthian parking garage and a sassy Siri navigational system, but even worse: a gracious coordinator in Curious Toaster’s Trevor Crippen; a crisply run meeting; creative Topics, and an edgy, content-rich speech by Mr. Crippen. To help ease the pain of the host club’s loss, Renaissance reviewed his speech by facilitating one of its famous group evaluations. We at Renaissance would like to thank all those in Curious Toasters for their hospitality and meeting excellence, and casually mention that the Gavel’s new home is with Renaissance Advanced Toastmasters. It can be seen displayed in its Lexan case, guarded 24/7 by several big, mean-looking guys with criminal records. And weapons. 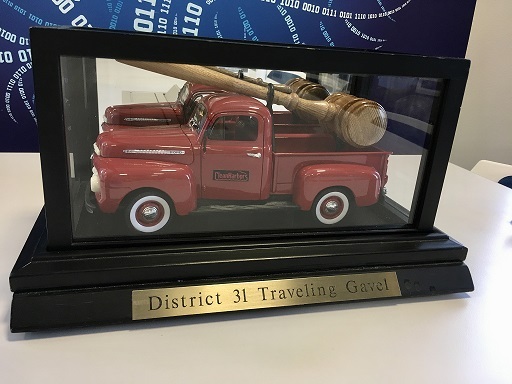 Note from webmaster: This account of the capture of the Traveling Gavel was provided by Rich Bianchi of Renaissance Toastmasters. There may be an exaggeration in their description of the guards. The toughest thing they do over at Renaissance is to have a group evaluation.